Requires a tractor with auxiliary hydraulics, preferably 50hp. Drill cannot be towed at high speeds. Planting width is 8 feet, total width is 11 feet. 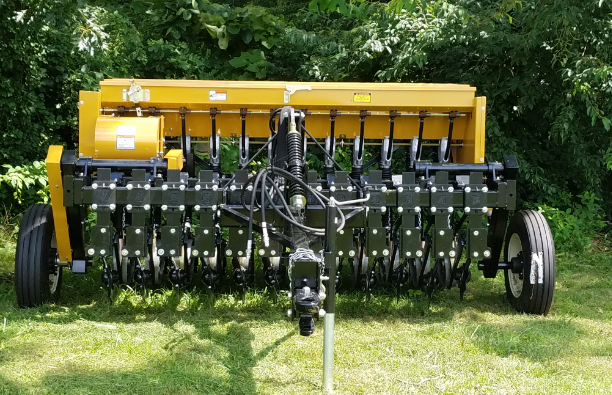 Adjustable depth control and variable seeding rate adjustments. Payment in full will be made on date drill is rented. 1. Read the Lease Agreement; complete it, sign it, and bring it with you when you pick up the equipment. The lease agreement is in .pdf format and opens in Adobe Reader. If you don’t have Adobe Reader, you can download it at get.adobe.com/reader. 2. Check the availability of this equipment using the calendar below. Available dates are selectable. As dates are selected, they are displayed at the bottom of the calendar. 3. Complete the form below and then click the Submit button to request a reservation for this equipment. Requests will be approved in the order received. 4. Watch your email for confirmation or call our office at 931-528-6472 ext 3.